For Isabella Richardson, acting is pushing boundaries. She throws her emotions into her characters, and therefore evokes viewers emotions, allowing them to see themselves in her portrayal. She is aware of the importance of her work and how it can impact the lives of her audience, and this knowledge allows her to fully commit to each and every role she takes on. The Australian actress is internationally sought-after, with an esteemed career at just nineteen years of age. Working on projects such as the sketch comedy show You’re Skitting Me, and commercials for Beyond Blue and Sprite, Richardson has won audiences over with her naturalistic approach to her craft. She never overacts, and that is what makes her such an outstanding talent. This is exemplified yet again with her work in the acclaimed film Next of Kin. “The story of the film is a relatable, but yet complicated interpretation of frustrations towards loved ones. We may get annoyed at the smallest things that someone you love does, but in the end, you adore them no matter what and should never take the little annoying things for granted, because you don’t know when they might be taken away from you,” said Richardson. The short film follows a policewoman whose job is incredibly straining on her relationship with her husband, who is also her partner in the police force. She has moments in the film of annoyances towards her husband, but in the end, realizes not to take the people she is surrounded by for granted, due to receiving a call about a young boy who was caught up in a terrible accident causing his death. “I really loved the director and his passion for movie making. The storyline of the film was incredibly deep, but also very simplistic that anyone who were to watch it would relate to the main character. I also believed that it would be an interesting character to try and put myself into,” she described. Richardson plays Kristine, a character whose boyfriend has just fallen off a bridge and died after doing daring tricks on his skateboard. Kristine is undeniably devastated and has to come to terms with just seeing her boyfriend fall to his death. She is comforted by the police officers and asked questions of the accident immediately following it. Kristine had a broken outlook on life until she met David, but he was rebellious and would sometimes do things that made Kristine uneasy. He was thoughtless at times when it came to how Kristine felt about certain activities he took apart, specifically the people he hung out with. Kristine is the kind of person who needs someone there at all times, she is very co-dependent due to her late family’s careless upbringing, and she relies on a safety blanket, that being David. Kristine is quickly faced with another death leading her to start living an independent lifestyle with the hopes of recovering any day now from all the loss she has experienced in such a short time. It was the first moment of a turning point that led to the rest of the films outcome. It was a pivotal moment of emotion that was needed to spark the main characters and their involvement with each other, and Richardson more than met the task at hand. “Working on Next of Kin was a truly interesting experience. I had never cried on camera, so that was probably the biggest challenge for me. I got into the mindset of this character by putting myself into her shoes. She had just seen her boyfriend fall to his death right before her eyes, so placing my own thought process into that situation brought up a lot of external emotion which I was able to translate into my characters own emotion,” she said. When looking for an actress who could convincingly capture the vital role of Kristine, director Nicholas Carlton immediately thought of Richardson. The two had worked together previously on the moving coming for Beyond Blue, titled ‘Preventing Youth Suicide.’ Richardson’s portrayal of a seventeen-year-old troubled skateboarder greatly impressed the director, and he knew her talent would be perfect for Kristine. “Isabella is featured in a short film that I directed called Next of Kin, and she played the character of a young girl who had just experienced her boyfriend’s death right before her eyes. Isabella brought a realistic aspect to this character. The situation is a devastating ordeal for a young girl to manage. She applied her training and techniques that she has learnt through her short years to reveal a compelling outlook of a simplistic character without any scripted lines. She worked with the me to fully understand the feelings that her character would have felt in that moment, as if she was in the characters shoes,” said Carlton. Next of Kin went on to receive praise as an Official Selection at the Byron Bay Film Festival where it premiered. Without Richardson’s authentic portrayal of Kristine, such acclaim may not have been possible, but for the actress, she simply enjoyed working alongside great people. “I loved being able to work with a great crew and cast. They all were incredibly lovely and I was met only with helpful, kind people. We all were there because we loved doing what we do and that was one of the things that made the whole experience so much fun,” she said. There is little doubt that Richardson will continue to be a name to watch out for on both the big and small screen for years to come. Often times the most successful child actors have more than just talent and a lovable face on their side they also have the ability to play characters much younger than they really are. In the same way that adult actors play high school kids—for instance, when 29-year-old Stacy Dash played 16-year-old Dionne in Clueless, and Leonardo DiCaprio played 16-year-old Frank Abangale Jr. in Catch Me If You Can at the age of 28, the capacity to believably portray younger characters has been integral to the success of many of the world’s most famous actors. 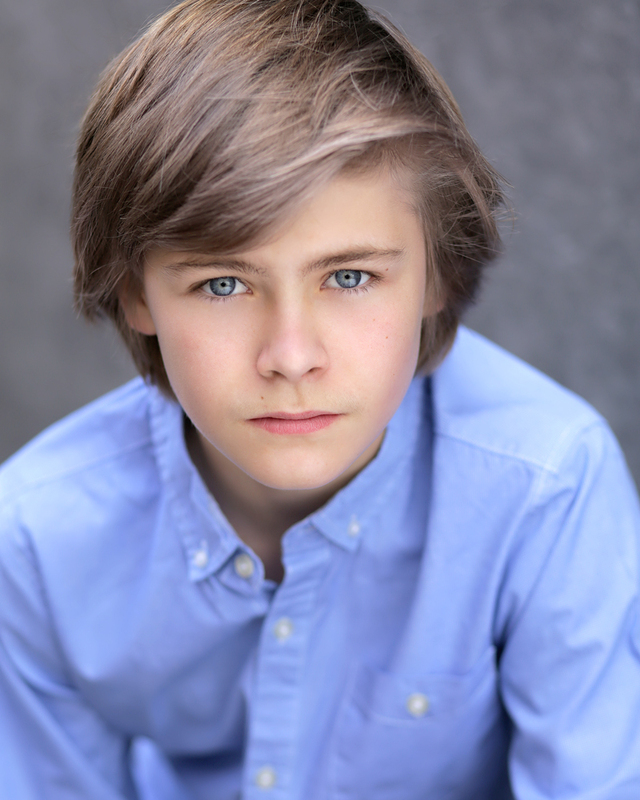 At 15-years-old Australian actor Caleb McClure has already achieved a level of notability in the entertainment industry that most actors can only dream of. To date McClure has taken on a slew of incredibly challenging characters in films including A View from Below, Zero, Arrival, A View From Bellow, I Am Evangeline and the upcoming film The Legend of Ben Hall, as well as the five-time Logie Award winning series Underbelly. McClure’s ability to play younger characters is an undeniable asset, but what makes him so extraordinary is the way he brings his characters to life, especially considering many of his projects have been heavy hitting dramas based on true stories. In 2013 McClure took on the role of Young Sylas, a 10-year-old boy whose life is changed forever after a mysterious object falls from the sky, in the multi-award winning film Arrival. McClure also played the starring role of Leopold, a young elementary school kid who struggles to hide that he’s HIV positive from the world in the film Where is Mum?, directed by Chantal Denoux, who received the World Medal from New York Festivals for her documentary My Home: Your War. Although McClure has proven his ability to portray younger characters with ease, those aren’t the only roles he gets cast in, and his malleable age range has definitely helped him create the dazzling repertoire of work he is known for today. In the film Holding The Man, which was released in Australia earlier this year and garnered the Awgie Award from the Australian Writer’s Guild, McClure took on the dramatic role of a young teen named Nick, the younger brother of Tim Conigrave. McClure brought an astonishing level of emotion to the role, which definitely helped drive the dramatic aspects of the story in the film. LG: Where are you from and how old are you? CM: I am 15 and I’m originally from Sydney, but I reside in Melbourne Australia. LG: When and how did you get into acting? CM: I started modeling for magazines and commercials when I was 4; and I landed my first film role when I was 8. The film was called Fairlight and I played the role of James. After that I landed the leading roles in over 15 short films, and I played very different characters in each one. My parents saw that I could follow direction from the director and how much I loved to grab a script and was committed to learning lines and developing my character. LG: What is it like having such a successful career at such a young age? CM: I absolutely love it and the feeling I get when I’m on set is like my own little world that I can transform. LG: Can you tell us a little bit about some of the film and television projects you’ve done? CM: In the film The Legend of Ben Hall, which is set in the 1800s and centers on the life of Ben Hall, an Australian bushranger who robs people and forms a gang, I played Frederick Nelson. As the eldest son of Constable Nelson, a policeman, I had to accompany my father who was on patrol of the bush to round up the criminals at bay, but he is shot by John Dunn and dies in my arms. As this is true Australian history as it is written, my role was important to the movie to show how this gang affected people. My role was intense at times with a lot of action and emotion so I had to be quick on my feet, and it was definitely physically challenging, as I had to run a lot in cold weather. The film was shot in winter so being outside in the bush was freezing, but it was worth it to be apart of this. I got to watch how props and mechanics work on set. I loved watching weapons being used and had a great time with the actors and the director was always fantastic. The costumes were amazing. Transforming into another era and becoming this character was great, and as this was based on a true story it was like taking a step back in time. Being Australian it was easy for me to relate to Frederick, as he is part of our history and I have a lot of respect for these people from that era. In the film Holding The Man I played Nick Conigrave, the younger brother of the main character Tim Conigrave. The film is about a love story between Tim and John, who fall in love while attending an all-boys high school and although their love endures over the course of 15 years as they manage to overcome through life’s challenges, when Tim gets aids everything gets much harder. As Tim’s brother I had to show a lot of emotion and be aggressive and upset. Being a member of a family with so much dysfunction that doesn’t get along well made things very dramatic, and my character brought a lot of drama to the story, which I actually loved doing. I was always on the lookout for anything that could help me bring this character to life in a realistic way. I like creating a fictional person with weaknesses, history, mannerisms, hopes, fears, someone that is often even more real than people you meet in real life. As the younger brother, my character couldn’t understand what his brother was going through and he was confused and sometimes scared by the way Tim acted when he’s pushed beyond his limits. Working alongside Guy Pearce and Ryan Corr and lot of others I felt a bit nervous before we started filming, but after I got on set and had gotten into my character I felt great. The cast of this was amazing and I felt great being able to watch and learn as they took the time to discuss the script and my character role before we would head out on set to act out our scenes. The costumes were funny as the film is set in the 1980s, but I related to this character and I felt right playing him because I understand what it was like to be bullied over things in life. In Underbelly, a crime series based on true stories, I played Ollie, a young boy under the watch of Squizzy Taylor, a notorious gangster in Melbourne in 1915 in the sixth season of the show. My character was poor and lived on the streets, and Squizzy would watch every move I made. My character was scared and submissive and he would have to steal for him in order to survive and in exchange he provided me with food and protection. I wore clothes from that era like woolen socks, which were very itchy and uncomfortable, and braces with a cap hat and thin shirts, so most of the time on set I was cold, dirty and itchy, which made me feel like I was actually living in that era. I also researched the era in order to better understand what the people had to go through and how hard living conditions were back then. In the film Holden Town I play the starring role of Mack, who lives with his single father, Billy Barker, a man who was once a household name throughout Australia, but now he struggles to make ends meet as he raises his two sons. My character needed money so he went to work on an apple orchard with some other young men, teaching him to realize that if he wants something he has to work hard for it. The film has drama, comedy and a lot of emotion, and having multiple genres in this film gives me the opportunity to change my character around a lot. We have only shot the trailer for the film so far, and we will begin shooting the film in 2016 with this being shoot being on location in Victoria, Australia. CM: In Underbelly it was interesting playing a kid that had to steal and survive on the streets in the 1920s. I think trying to understand what it was like back then compared to the way things are with technology today was a cool experience. We have come along way since then, and I researched that era in order to get an idea of how people lived then and how tough it was. Being as Holding The Man is based on a best selling novel on someone’s real life and I was playing the brother of Tim Conigrave, I had to research my character, as he was a real person with his own story and that made the experience really amazing. It was also interesting knowing that this love story took place during a time when there were a lot of negative feelings towards gay people. CM: The character and what’s behind the role, I try to find something I can relate to or is challenging, and something that I can accomplish in a great way. I also look for roles I’ve never done before in order to give my career and my craft a bit of diversity and ones that I can learn from. I’m interested in whatever will carry me to the next level as an actor so I can continue to make good movies. LG: Have you done any commercials? CM: Yes I’ve done several commercials for Brisbane Racing Club, Skwirk, Jump Factory Trampoline Park in Melbourne, Master Electricians, Nissan X Trail, a toy commercial for Target, David Jones the Australian department store, and Anzac Day for News Corp, which aired on all of the television channels, Internet, and in movie theaters. LG: Is it overwhelming at times to be receiving so much recognition for your work so early on? How do you balance being a kid with having a career? CM: While the film industry is incredibly hard and demanding, I have courage and inspiration to carry me through. In my spare time I love bike riding and being outdoors, and these things bring balance to my otherwise demanding schedule. CM: My favorite roles would have to be Underbelly as Ollie and Holding The Man as Nick, because I got to meet talented and experienced actors that helped me a lot on set with guidance. They were very caring and supportive. I also found it awesome to be in two different totally different eras, the 1920s and 1980s, with different costumes. LG: Which actors do you look up to, and why? CM: I have two favorite actors one is Australian Ryan Corr and American actor Leo DiCaprio because they both can carry different characters with their natural ability and shine in any character they take on. If I had a dollar for every time someone said that I look like Leo I’d be rich! I would love to work alongside him one day! I look up to so many actors and I enjoy watching television shows, but I also look at the actors’ work and craft and find things that they do in their acting that I like and can learn from. CM: Definitely drama and horror, but at the end of the day every genre is great, and there’s nothing like a bit of action either. CM: My focus and dedication to the craft, and my ability to get on with the task at hand without distraction, and at times my quirkiness. I always have a good time on set and I like to have fun. I am very respectful to those I work with and my surroundings, and when I set my mind to something I like to bring it to life for the audience. LG: You’re also a “Don’t Bully” ambassador– can you tell us about what that means and what the organization does? CM: “Don’t Bully” is very important to me because, unfortunately there are some people who treat others with no compassion, kindness or respect, they also humiliate and berate people to the point of depression, which can cause suicidal thoughts. This is wrong, we as a society need to stand up and speak out for the silent, for those who do not have the strength or courage to stand up for themselves. No one has the right to bully, intimidate or humiliate another person, and “Don’t Bully” to me, is a way to stand up and speak out for those who cannot do this for themselves. I am passionate about “Don’t Bully” because I want to make a difference. I want to help others who have been in my situation being bullied and I really want to send the message to the all of the bullies out there that it is NOT COOL and it’s NOT OK… I want to make a difference for this generation and our future generations. LG: What projects do you have coming up, or have you recently finished filming? CM: Holding The Man is about to be released in America and it has done very well in Australia. Also The Legend Of Ben Hall is in post-production and will be released soon as well. LG: What kind of training are you doing to better your craft at the moment? CM: I’ve been training my American dialect with a coach; and I also train with another coach who helps me with comedic timing and voice control. LG: Why is acting your passion and chosen profession? CM: I have always enjoyed playing characters. I have fun reading scripts and feeling the character’s emotions and feeling like I am in the story. LG: If you weren’t an actor, what other profession do you think you would like to do in the future? CM: That’s very hard as I’m still growing up in the world, but I find I would like to do anything with film. LG: What are your hobbies outside of performing? CM: My hobbies are Bmx riding, collecting coins, antiques and hanging out with my friends at the local skate park. LG: You’ve also had a lot of success as a model, can you tell us about some of the modeling jobs you’ve done so far? CM: I did Elle magazine’s kids section, which went all through Asia.